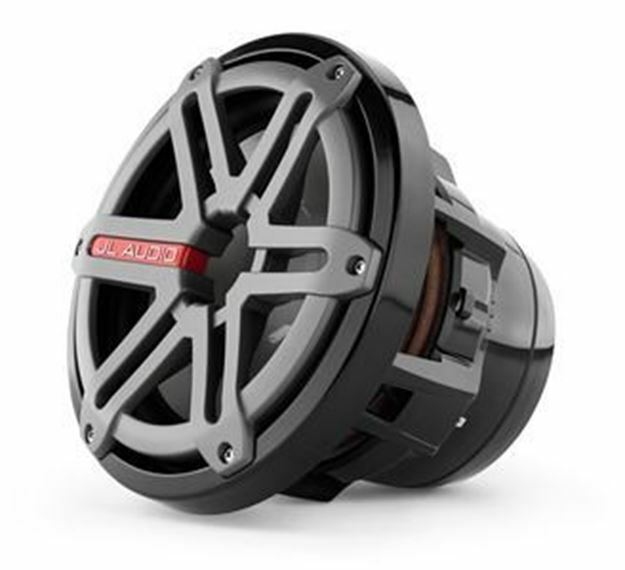 M8IB5-SG-TB M-Series 8-inch Marine Subwoofer Driver for Infinite-Baffle Use (200 W, 4 Ω) - Titanium Sport Grille M880 Overview With appropriate system setup, the addition of a subwoofer allows your smaller main speakers to be free of the burden of reproducing low frequencies. This allows your whole system to play louder and to sound cleaner at all listening levels. Purpose-engineered and built for real marine duty, the M-Series infinite-baffle woofers are designed to operate without a dedicated enclosure. Long excursion capability and rugged suspension systems help produce deep, powerful bass response that will transform your boat's audio system. The M8IB5 is best used with amplifier power in the 50W - 200W range and is optimized to operate with just a large volume of air behind it (at least 1.5 cu. ft. / 42.5 l). If you prefer to use a dedicated enclosure, refer to one of the suggested designs located in the Specifications section for optimum performance. Like all JL Audio marine speakers, this driver is built to withstand a real saltwater marine environment and deliver years of listening enjoyment.